A lot of people have asked this rather fundamental question. While driving, what is the difference between a yellow and a white line on the road? Why are some of them broken lines and some of them continuous? Well, it’s not that difficult to understand. So here they are. With pictures. Note: This post only aims to highlight lane markings that are along the length of the road and not the width of the road. Those along the width are easy to understand: They are basically Rumble Strips, or Pedestrian (Zebra) Crossings. There is no concrete standard for Yellow vs White, but Yellow is used in some countries such as Mexico, the Netherlands, the United States, and Canada, the yellow line is used to separate two carriageways in an undivided dual-carriageway road. In simple terms it is used to separate traffic in different directions. In Sri Lanka, it is used for pedestrian crossings and related markings. However, they are slowly being replaced by white due to increased visibility. Now, for the lines themselves. A two laned road in the Rann of Kutchh with a broken white line in the centre. Image copyright Mohammed Shafiyullah, CC-BY-SA 4.0 International, Wikimedia Commons. A single broken line indicates that traffic can move normally on its own lane, but can cross over to the other side to overtake. In the case of dual carriageway roads, this would mean you can drive on either side of the road, and can change lanes, but with caution. On single carriageway roads, it would mean stick to your lane, the other side is for vehicles travelling in the opposite direction, but if it is empty for a significant distance, you can cross over to overtake a vehicle in front of you. A solid white line at Šafárikovo námestie square in Bratislava near Starý most bridge. Image copyright Aktron/Wikimedia Commons, CC-BY-SA 3.0 Unported. A single solid line has different meanings in different countries. In India, it would mean no overtaking, or no crossing the line, except in case of a dire emergency. Turning, however is allowed, in to a lane or a gate. On single carriageway roads, it is usually found in areas where there is a sharp curve or a steep gradient, like in ghat sections. On dual carriageway roads, it is commonly found around intersections and traffic signals, thereby implying that vehicles maintain lane discipline and stay in their respective lanes while waiting at a signal. Double Solid Lines on the Colin Knott Drive/Olympic Highway looking south bound on the Boorooma Street overpass. Image copyright Bidgee, CC-BY-SA-3.0 Unported/Wikimedia Commons. Double Solid Lines are a more stringent version of single solid lines. 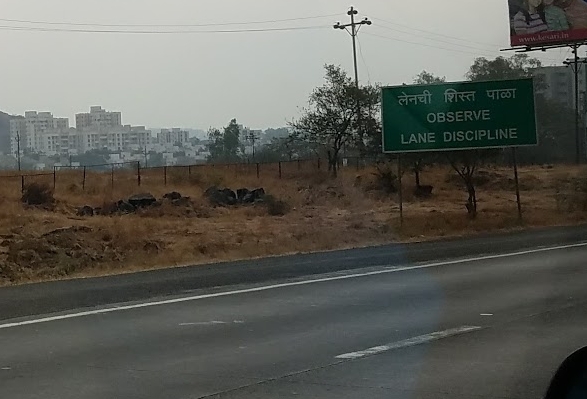 In India, they are used where the road isn’t a proper dual carriageway road, but each carriageway is more than one lane (But less than two) wide. In simple terms, it is used on roads that are three-ish lanes wide. In Sri Lanka, it is considered on par with a solid median and attracts a heavy penalty if crossed. Vehicles cannot take a turn when a double line is there. Single Solid Line and Single Broken Line on US 84 in Wayne County, MS near Tokio Frost Bridge Rd. Image copyright Xnatedawgx, CC-BY-SA 3.0 Unported/Wikimedia Commons. A rather interesting combination, the Single Solid and Solid Broken line combination does exactly what the two are supposed to do as described earlier. For vehicles travelling on the side of the solid line, crossing it is not allowed, while those travelling on the side of the broken line can. It is normally found in rare stretches, mostly in areas with both a steed gradient and a sharp curve that makes maneuvering difficult in one direction but not the other. Wavy Zig Zag Lines Used Near a Pedestrian Crossing near St. Pauls Cathedral in England. Image copyright Benjamin D. Esham / Wikimedia Commons, CC-BY-SA-3.0 Unported. The Wavy or Zig Zag Line, is another fascinating lane marking. Seldom seen in India, it seen across other Commonwealth Nations such as the United Kingdom or Sri Lanka. Its main purpose is to inform the motorist or driver that a Zebra Crossing or Pedestrian Crossing is coming ahead. Vehicles are generally not supposed to stop in the region with the zig-zag lines, but slow down and stop in front of the crossing itself. Diamond Marker on I-24 outside Nashville, TN. Image copyright Goldwiser/Wikimedia Commons, CC-BY-SA 3.0 Unported. So, that pretty much explains how Lane Markings work. A very special thanks to Mr. Oneil who explained the road markings in Sri Lanka to me. Featured Image: Lane Markings at Kandy, Sri Lanka, Image: Srikanth Ramakrishnan/CC-BY-SA 4.0/Wikimedia Commons. I never knew that the significance of all the different types of lines and also about zig zag lines. Thanks for such an informative post Srikanth. Road linings are important for safety on all kinds of roads, from tiny country roads to vast motorways for numerous reasons. One of the main reasons is probably that they give instant instructions to motorists; highly visible white and yellow linings separate traffic lines to keep drivers safely on the correct side of the road, indicate areas where other lines of traffic merge into main roads, can be used to indicate speed restrictions, mark out specific cycle and bus lanes and give various instructions such as where to give way and where there may be potential hazards. Certain road markings indicate where it is safe for pedestrians to cross the road, for example zebra crossings and others such as single and double yellow lining show where parking isn’t allowed, helping drivers to avoid fines. Nicely written. Never knew there were so many. And what’s with Sri Lanka having such superior roads than us? Previous Previous post: Uber Movement: Can it help us solve our Transport Problems?